Pillars of Plato is a simple game of strategy. 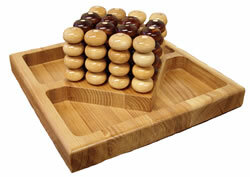 Players alternate trying to line up four of their colored pieces on the peg board diagonally, horizontally or vertically to win. Francis Bok was seven years old when Muslim raiders from northern Sudan stormed the small Dinka village where Bok was selling eggs for his mother. They murdered all the men and kidnapped the women and children to serve as slaves for wealthy Muslim farmers. Bok was enslaved for ten years before finally escaping the clutches of his master in 1996. He immigrated to the United States a year later. In Escape from Slavery, Bok writes that he was one of thousands of enslaved Dinka children. The war against the Dinka tribes by the Muslims of northern Sudan has caused the death of two million southern Sudanese and displaced four million more - many of them forced into slavery. Raiders have routinely kidnapped children as young as seven, often brutalizing and torturing them, and cutting off a child's arm or leg if an escape is attempted. One ten year old had nails driven through his knees. Bok was beaten and fed little more than garbage for ten years. "When you add religious fanaticism to an ancient feeling of superiority of one people to another, you have a deadly and extremely cruel combination - as Americans found out on September 11...Before 9/11 this argument was not an easy one to make. And while Osama bin Laden strikes most Americans as a crazy terrorist from Saudi Arabia, we Sudanese remember that before he went to Afghanistan he lived in Sudan protected by the equally fanatical Islamist government that remains in power. Imagine a country filled with Osama bin Ladens…it has been the reality of Dinka life for decades." 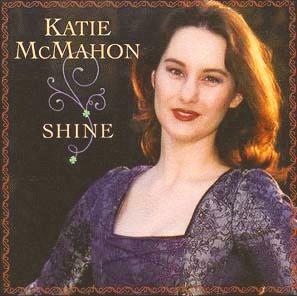 Katie McMahon is best known as the original voice of Riverdance. Her voice has been described by the Irish Times as "Poetry, perfection and purity." Now she lives in the USA and produces her own music with her band and troupe of Irish dancers. Over the decades that I have observed the media in action, I have concluded that their bias against conservatives is not a fluke. It is not an occasional thing. Most reporters and editors misrepresent the views of conservatives so consistently and with such malice that they simply must know what they are doing and must do so intentionally. It is also clear to me that the major media networks have all but abandoned any sense of journalistic ethics. They are on a campaign to rid the world of the "cancer" of conservativism, so in their minds, that "worthwhile" goal justifies all of their dastardly deeds. Their cheating is not an evil thing to them, because they see the destruction of the conservative movement as a worthy cause. They are just being good soldiers in a "just" war. As I write on Wednesday afternoon, the CBS News website continues to offer a complete "photo essay" of naked Iraqi men being humiliated by Americans in a variety of poses. But the video of Berg's beheading, CBS says, "is too gruesome to show." No other network and no newspaper that I have seen shows the gory pictures, either. What exactly is the governing rule here? That incendiary images sure to enrage our enemies and get more Americans killed should be published while images that show the world just how evil those enemies really are should be suppressed? Offensive and shocking pictures that undermine the war effort should be played up but offensive and shocking pictures that remind us why we're at war in the first place shouldn't get played at all? Yes, Virginia, there really is a gaping media double standard. News organizations will shield your tender eyes from the sight of a Berg or a Daniel Pearl being decapitated, or of Sept. 11 victims jumping to their deaths, or of the mangled bodies on the USS Cole, or of Fallujans joyfully mutilating the remains of four lynched US civilians. But they will make sure you don't miss the odious behavior of Americans or American allies, no matter how atypical that misbehavior may be or how determined the US military is to uproot and punish it. You can hide the sound box anywhere and let the annoying sounds drive people crazy. We have loaded this device with the most irritating sounds we could find: a mosquito buzzing, a cell phone ringing, a beeper going off, water dripping, crickets chirping, a telephone off-the-hook sound and a cat's meow. Works through walls and up to 100 feet away! This full length cookbook features recipes that you can use with many of the cooking products advertised on TV. If you've ever bought a George Foreman Grill, Showtime Rotisserie, or almost any other As Seen On TV cooking product, this cookbook will have special recipes just for you! And Where's That A-List When You Really Don't Need Them? Wizbang has had 237,000 visitors today, and the day is only half over. This is a result of a my post linking to the video of the execution of Nick Berg (the video is now available directly as well). What has happened here is the media has really missed the Nick Berg story in a big way. Go read this post and follow the linked trackbacks to this post and see all of the other bloggers getting insane (for blogs) amounts of traffic. Even Glenn Reynolds is wondering where his 200,000 page views yesterday came from. Since I can't access e-mail at all until this evening I can't send him a note and tell him, but most assuredly it's the Nick Berg link he had two days ago. There are millions of people looking for news on the Nick Berg execution today, and big media is not serving them. Those millions of people are visiting blogs today instead of The New York Times, The Washington Post, CNN, MSNBC, Fox News, etc. See Paul's post below on why the video remains available here. Unlike the networks, we expect that you can decide for yourself whether you want to read about and watch the Berg video. What's also amazing to me is how the self-appointed A-List bloggers such as The Cluetrain Manifesto authors Chris Locke, Doc Searls, and David Weinberger have completely missed this aspect of the Berg execution as well. They're always telling us that they were always the first to tell us how the internet and blogging will Change The World. But now it looks like they're, uh, clueless . . .